A Fortune Magazine article warns that universities should hate the iPad as it will infringe on profits in the campus store. The University of California, San Diego, is going the other way. Its campus store stocks not only textbooks and collegiate gear, but runs a green grocer, a convenience store, sells computers and iPads, and does computer repair. Students began changing their campus store habits long before the iPad came onto the market. Due to the ever-increasing costs of textbooks and the availability of auctions and textbook rentals, students have been shunning the practice of buying books on campus in favor of cheaper options. Indeed, some colleges, including Wesleyan College in Macon, Georgia, have eliminated books from their campus stores. Wesleyan College, a nearly 150-year-old institution (and the first chartered women's college), made the decision to save its limited space and open an online bookstore instead through MBS Direct. The campus store sells stationery, art supplies, spirit wear, and some room decor items. MBS Direct, one of the online companies that is changing the landscape of the campus store, partners with schools to allow them to continue to profit from book sales without ever having to touch a textbook. While MBS sells and buys back textbooks, other schools use book rental partners such as Bookrenter.com or Follett Higher Eduction Group, among others. Nearly every major university campus store now has a strong online presence. The Cornell Store allows you to shop online for tech products, spirit wear, and books. The Princeton University campus store is clearly more about gear and gifts than books, which are purchased separately at Labyrinth Books through book sales and rentals. Still, iPads are creating the next stage of evolution at the campus store. Many colleges have Apple-authorized campus stores selling not only Mac products, but the same iPad likely to kill its book sales and book rentals business. One such college with a sizable Apple store is Auburn University, which I recently visited and found lots of computers, school gear, and study guides, but very few books on display in the campus store. 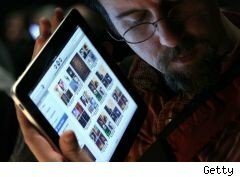 Many colleges are embracing the iPad and are planning experiments to test its usefulness in the coming year. IPads are being distributed to students to allow the school and faculty to gauge the benefits and limits of the technology. Some of the colleges giving iPads to students this fall are Seton Hill University, Northwest Kansas Technical College, George Fox University, Duke University, the University of Maryland, and Reed College, which will have the iPads loaded with course readings, and Indiana University. These experiments will surely net mixed results, but it is clear that due to the evolution of technology, campus stores may soon be out of the book selling business.